HUBBARD A Mass of Christian Burial will be held on Wednesday April 17, 2019 at 11:00 AM at St. Patrick Roman Catholic Church with Rev. Michael Swierz officiating for Shirley D. Fair, 84, who died Monday morning April 15, 2019 at Sharon Regional Hospital. She was born January 1, 1935 in Youngstown, a daughter of Joseph and Grace B. Livingston Jones. She had moved to Florida in 1984 and moved back to Ohio in 2011. Mrs. Fair, of the Catholic Faith was a salesperson at Sears Roebuck and Company for 10 years. 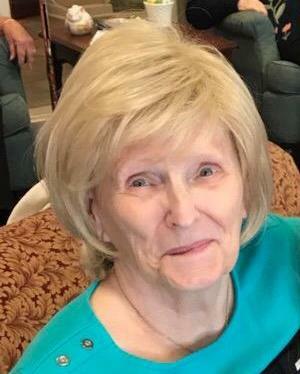 She enjoyed picture and crossword puzzles and being outside, but especially loved being with her family. Her first husband, John M. Kollar, whom she married December 4, 1954, died December 10, 1970 and her second husband, Richard P. Fair, whom she married in 1974, died in 1983. She leaves a son, John M. Kollar and his girlfriend Christine Thomas of Hubbard; two daughters, Joan Marie Bulmer of Hubbard and Ronnie Weller and her husband Jim of Liberty; one sister, Sara Cooper of Hubbard; 6 grandchildren, Janel Kollar and her boyfriend Mike Rubadue, Michelle McMeechan and her husband Craig, Stephanie Kollar and her boyfriend Brent Hackworth, Jimmy Weller and his wife Katie, John Weller, Kelly Kollar and her boyfriend Dylan Hritz and 1 great granddaughter, Lexi Hritz. Shirley was preceded in death by her parents; 2 brothers Joe and Lovie Jones and 7 sisters, Vivian Serrecchio, Vera Taylor, Gertie Dudley, June Vito, Rosalie Bergman, Ruby Nashette and Nellie Shoenberger. Family and friends may call on Wednesday April 17, 2019 from 10:00 AM to 10:45 AM at St. Patrick Roman Catholic Church. Arrangements are being handled by the Kelley-Robb-Funeral Home.